WASHINGTON (July 01, 2008) -- Some 31 Americans pledged or re-pledged themselves to service in the U.S. Army Tuesday during a ceremony at the Pentagon to commemorate the 35th anniversary of the all-volunteer force. A total of 16 Soldiers and 15 young civilians or "future Soldiers," participated in the ceremony in the Pentagon courtyard marking the day in 1973 that established the all-volunteer Army. Since then, the U.S. Army has been manned by those who volunteered to serve, not by those drafted into service. 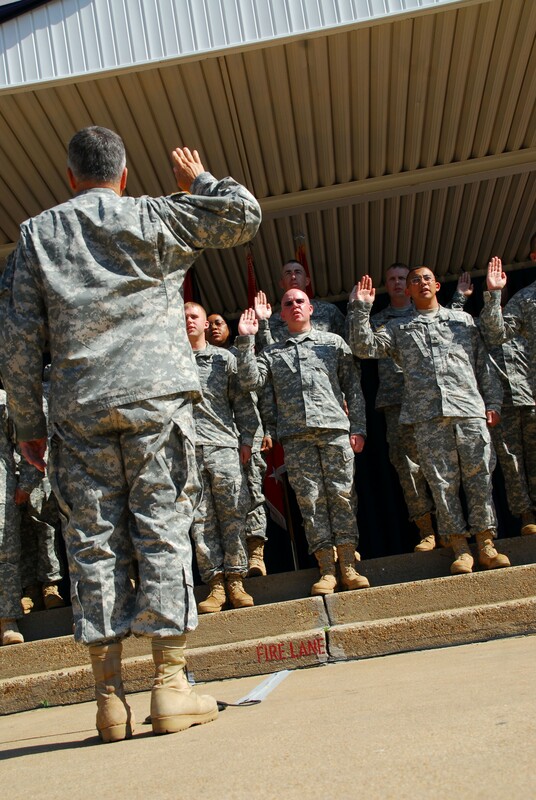 Chief of Staff of the Army Gen. George W. Casey Jr. administers the oath of enlistment to 16 Soldiers during a ceremony July 1 in the courtyard of the Pentagon, Washington, D.C. The ceremony was held to commemorate the 35th year of the "all volunteer force." Since 1973, the U.S. military has been manned by those who volunteered to serve, not by those drafted into service. During the ceremony, the chief of staff also administered the oath of enlistment to 15 young civilians who have opted to joint the Army for the first time. "Today we celebrate two occasions, your enlistment or re-enlistment; and the anniversary of the all-volunteer force," said Secretary of the Army Pete Geren. "Two celebrations made possible because men and women like you stood up and said here am I, send me. I can tell you, when you look around you today and see who stands behind you and who stands with you, you know you do not stand alone." Today, over 1 million Soldiers serve in the U.S. Army, in both the active and reserve components, the secretary said. Along with those Soldiers are more than 200,000 Army civilians, over 200,000 Army contractors and more than 600,000 Army family members. As those 31 Americans prepare to embark on their journey in the Army, or to continue serving, their efforts will contribute to the best professional Army in the world today, the secretary said. "Today you join or rejoin, the best led, best trained, best equipped Army on the face of the earth," he said. "Thank you for your commitment, you are the greatest of this generation and we pledge our best to you and your families. And we celebrate today the 35th anniversary of what you are -- a national treasure, an all-volunteer force." After administering the oath of enlistment, Chief of Staff of the Army Gen. George W. Casey Jr. congratulated those enlistees and re-enlistees, and thanked them for their service to the Army. He also reflected back to his early days, as a lieutenant, and his perceptions of the new all-volunteer force concept. "I can remember back in the early days of the 1970s as this program began to unfold," the general said. "Lt. Casey and his sergeants were wrestling then with these notions that were sure to undermine the discipline of this great organization: beer in the mess hall, brand new furniture in the barracks, and no longer having to sign in and sign out to go on pass." Then Chief of Staff of the Army Gen. William C. Westmoreland and Secretary of the Army Stanley R. Resor had a vision of how the Army should work, he said. They believed the changes they made would instill discipline in a force and help create a more disciplined Army than what existed after the Vietnam War. "And not surprisingly, the chief was right and Lt. Casey didn't quite get it right," he said. "The force that has grown from those humble beginnings is the most resilient, combat-seasoned, professional force the world has ever seen -- and you are joining that force today." The general said he knows there is much speculation as to why Soldiers choose to enlist in the Army, but he has his own ideas about why young Americans make the decision and then choose to stay. "I believe it is because first of all, men and women like these believe in the values and ideals this country stands for," he said. "They believe they can make a difference in the word at a critical time in our nation's history. And they are quite proud to be part of an organization that is resoundingly the best in the world at what it does." Evan Shamon, a graduate of Garfield High School and a resident of Woodbridge, Va., is one of those that chose to serve his nation in a critical time. "For once in my life I wanted to do something for the experience," he said, also saying a stint in the Army promises to open his eyes to the rest of the world. "I've stayed in the U.S. my whole life and have never been overseas. This gives me the opportunity to do that, to meet people, to make friends and to see things." While in the Army, he plans to work in signals intelligence. The job was made available to him because of his high scores on the Armed Services Vocational Aptitude Battery. Shamon had also been party of the International Baccalaureate program while in high school -- a series of advanced coursework designed to broaden the minds of participating students. Shamon said he met some resistance from his friends about joining the Army, but not a lot. He said his friends know what it means when he commits. "For me it's pretty easy, my friends know once I decide I'm going to do something, I do it, I stick with it -- there's no deterring me," he said. That kind of dedication is what Shamon said he'll bring to the Army once he's in uniform. "I bring the dedication and the service," he said. "When I do my job, I do it to the best of my abilities. And I'm always striving to better myself."